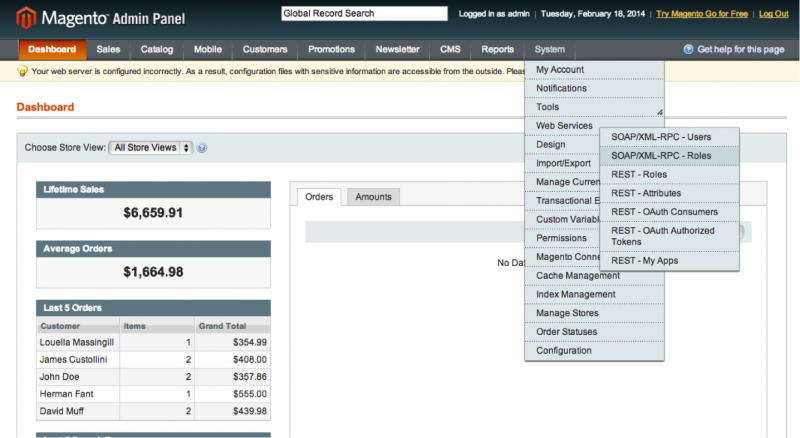 OroCRM supports out of the box integration with Magento. The integration enables loading data from and to a Magento-based eCommerce store (“Magento store”) and processing it in the OroCRM. 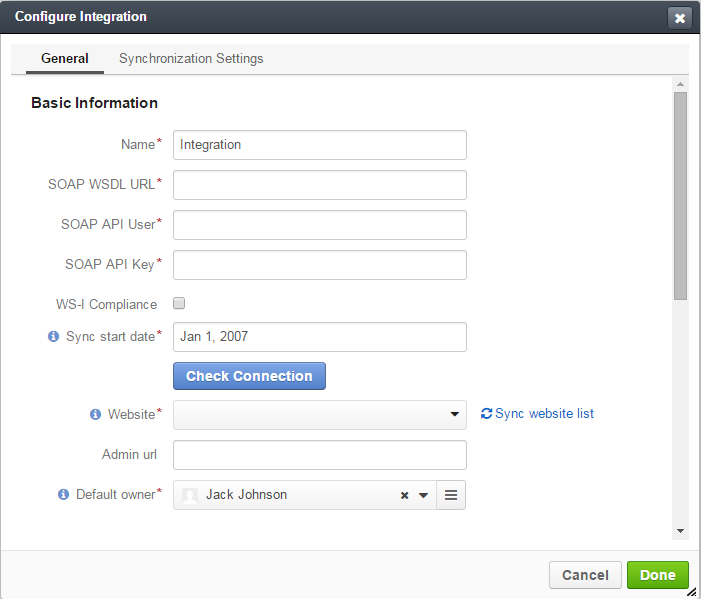 This article describes how to define and edit the integration and synchronization settings. The integration is made possible with the OroCRM Bridge Magento Extenstion. The OroCRM Bridge can be installed through the MagentoConnect. The integration can also be created without installation of the OroCRM Bridge Magento Extenstion, however the synchronization will then take longer, and some options, such as two-way synchronization, and synchronization of the custom records data will not be available. Click the Save Role button. The role will be saved and you will get to page of the role. You can also click the role name in the grid at any time to get to the page of the role. You will get to the Users grid. Click the Add New User button. User Name* The name used for login into the account. First Name* The first part of the name displayed in the system to refer to the user. Last Name* The last part of the name displayed in the system to refer to the user. Email* The email address of the user. API Key* Define a password for the account. The key shall be at least 6 symbols long. API Key Confirmation* Confirm the password. You can also click the user name in the grid at any time to get to the page of the Role. Select the role that you’ve created for your store above. Click the Save User button in the top right corner. The CSV support is not supported for the initial import of Magento data to OroCRM, but if you have concern as for the impact the import might have on the production environment, you can set-up a staging instance with the latest production data, run initial synchronization on the environment and update the integration url to production once it has been done. 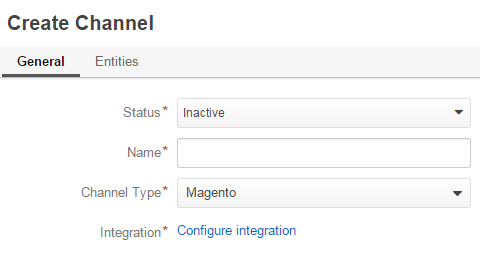 As soon as the channel type is set to Magento, a mandatory Integration* field will appear in the General section. Name* The configuration name used to refer to the configuration within the system. SOAP WSDL URL* A URL of the SOAP v.2 WSDL source (this is the URL of your Magento installation plus api/v2_soap/?wsdl=1). 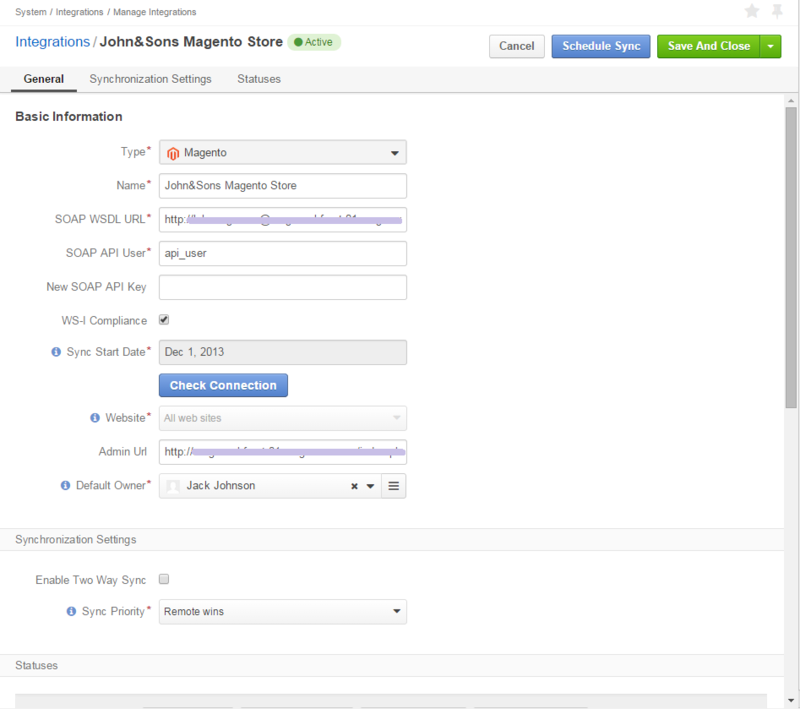 For example, if your installation were available at http://example.com/magento/index.php/, the SOAP WSDL URL would be http://example.com/magento/index.php/api/v2_soap/?wsdl=1. SOAP API Key* The API Key defined for the Magento user above. 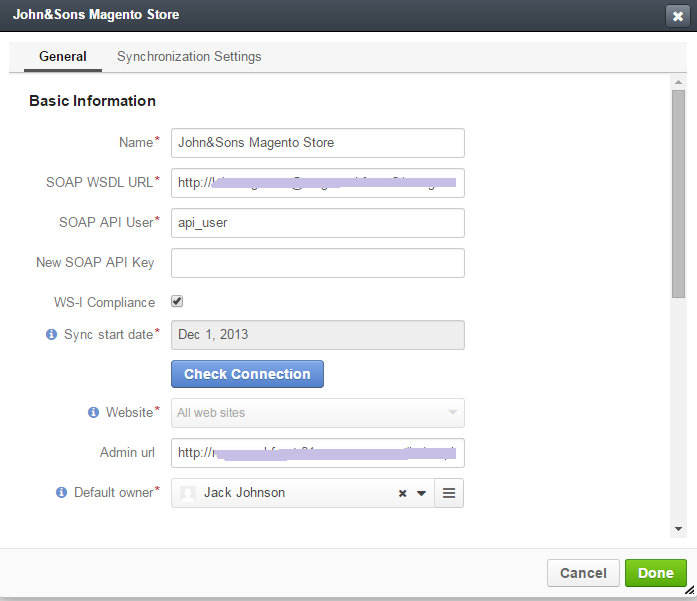 SOAP API User* The username defined for the Magento user above. At this point, click Check Connection, to see if the settings defined above are correct. Once the connection details have been verified, the following fields will be filled with default settings. Default owner* Specifies what users can manage the configuration, subject to the access and permission settings. By default is filled with the user creating the integration. The view page of the integration will appear. Click Schedule Sync. A sync job has been added to the queue. Check progress. note will appear. The data is being synchronized. You can click Check progress link to see the synchronization status. After the successful synchronization, details of the Magento entity records defined for the channel will be loaded to OroCRM and can be processed therein, for example cart can be converted, customer details can be edited and new customers can be added to the system.